In January 2011, Spanfeller Media Group proudly launched a pretty, new food site, The Daily Meal. Over a year later, SMG is finishing what it started, and adding the platform’s missing ingredient -- video. “The complexities with doing [video] right along with the work involved in launching a new site prevented us from the optimal solution out of the gate,” admitted Jim Spanfeller, president and CEO of SMG. Available across the site’s multiple channels, the new video network offers a mix of features, including step-by-step recipe guides; behind-the-scenes looks into various eateries; and discussions with professional chefs and culinary stars, such as Tom Colicchio, Gail Simmons, and Mario Batali. Fully owned and operated by The Daily Meal, the video platform debuted this week with over 300 originally produced segments. New features should be added regularly, according to Spanfeller. The Daily Meal Video Network will attempt to set itself apart with smart navigation features, an HD player, social media options and a site-wide program guide. Streaming pre-roll and mid-roll ads units with static companion ads will be available for promotional placements. The site is also working with advertisers to create custom content within the video network. Last December, The Daily Meal unveiled its e-commerce site in partnership with Cooking.com, coined The Daily Meal Shop. 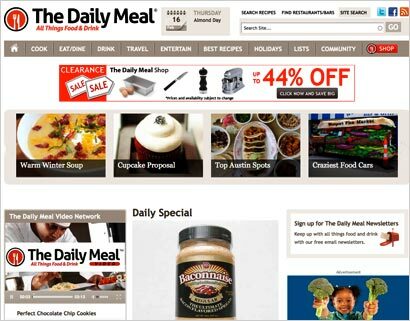 Since its launch in January 2011, The Daily Meal has evolved into a robust site with over two million unique visitors per month, according to SMG.